home away from home. 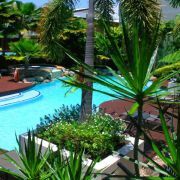 Our year round tropical climate allows us to make the most of the great outdoors, and you will find that all resorts and holiday apartments have at least one pool, if not a few, plus onsite bbq facilities that provide a perfect way to entertain the family whilst on holidays. You can find many family discounts on activities and attractions around the region, plus stay/pay deals on long stay accommodation. Ask one of our friendly consultants who will happily recommend the best accommodation and tours to suit your families needs and budget. Holiday apartments are ideally suited to families. 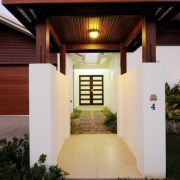 They come fully equipped with all you need for a long or short stay. 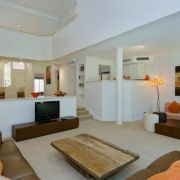 Standard features include cooking facilities and all modern conveniences such as television, DVD, and internet access. Luxury apartments additionally may include features such as a European-style gourmet kitchen with all modern appliances, generous wardrobe space, full-sized washing machine and dryer, ensuite bathroom with oversized bath. 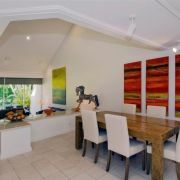 The benefits of booking a holiday apartment include more space and privacy, plus the savings associated with dining in rather than dining out. If you have any family members with special dietary requirements or a fussy eater, then it is much easier to deal with in your "own" kitchen. A Coles Supermarket is located on Macrossan Street for all your grocery needs. 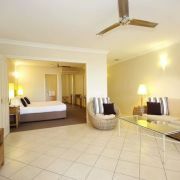 Our pick of the family friendly accommodation includes the Rendezvous Reef Resort, located just a 5 minute drive from the Port Douglas Village. 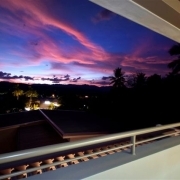 This newly refurbished resort comprises of a village of villas, offering the freedom of self-catered accommodation in a full service resort atmosphere. Kids will love the four pools including two large lagoon style pools, playground and sandpit plus 15 acres of lush tropical gardens to explore. A full breakfast for 2 adults and 2 children under 12yrs is included in the daily rates. 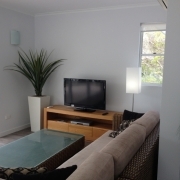 The Mantra Portsea is located just 100m from the beach and a short 15 minute stroll to the village centre. 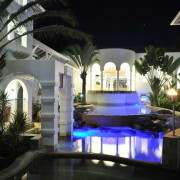 This property has water features and swimming pools galore! There is a toddler's pool, 2 spas, a water slide and waterfalls as well as the main lagoon with a carved crocodile feature. 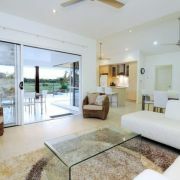 A footpath is located alongside the property giving direct access to 4 Mile Beach. The apartments feature a kitchenette including hotplates, microwave, utensils and fridge so you can prepare simple meals during your stay. 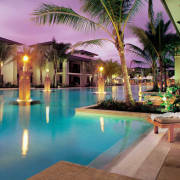 The Sheraton Mirage offers the ultimate in resort living. Located within 130 hectares of tropical landscaped gardens, championship 18-hole golf course and 2 hectares of magnificent swimmable saltwater lagoons, there is plenty to keep all the family amused. Depending on the size of your family you can choose from a hotel room or one bedroom suite, up to the 2, 3 and 4 bedroom villas. Food & beverage options are plentiful, and included in the rate is a daily buffet breakfast in the Lagoons Restaurant. A Kids Club runs throughout all Australian School Holidays and is available for children aged 4 to 12 years. Activities include pool games, arts & crafts, sandcastle competitions, puzzles & games, painting, jewellery making, DVD's, ball games and lots, lots more. Package deals are a real winner for families, they offer fantastic savings, and with the most suitable touring and accommodation options pre-selected, it makes your holiday planning easy and hassle free as we take care of all the details for you. 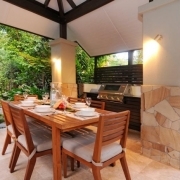 Our top family package deals include the Family Fun Port Douglas package. This package includes 7 nights accommodation at the Rendezvous Reef Resort including a full buffet breakfast daily, and the Wavedancer Low Isles Cruise. The Rendezvous Resort offers exceptional value with many resort facilities to keep the kids entertained for hours. The Adventures in Port is a popular package combining central accommodation with tours taking in the very best of our two World Heritage sites - the Reef and Rainforest. 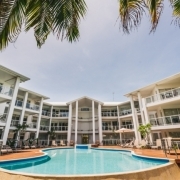 Included is a Two Bedroom self-contained Apartment at the Reef Club for 7 nights, a Daintree & Cape Tribulation trip and Outer Barrier Reef Cruise onboard Poseidon. If you don't see your perfect family package advertised then speak to one of our friednly consultants who would be more than happy to help create a package to suit your budget and requirements. 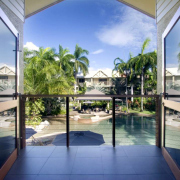 Kids will love holidaying in Port Douglas, there are some lovely family activites that take place in and around the village. With a warm, year round tropical climate, it's the perfect destination for the kids to get active, explore nature and enjoy the great outdoors. There’s no better way to see Port Douglas than on a bicycle. Cruise along Four Mile Beach on take an easy excursion into the village. There are also many rainforest tracks scattered around the region. Port Douglas Bike Hire has quality bikes to hire for all ages, that can be delivered to your door that makes for a great half day or full day family excursion. Next to the marina is a restaurant called On the Inlet, that happens to have a resident groper by the name of George. George weighs about 250kg and is one of the largest fish that inhabits our waters. Queensland Gropers can grow up to the size of a Volkswagen! George visits On The Inlet regularly in the afternoon at approximately 5:00pm for feed time. His favourite delicacy is a tuna frame, and you can watch as he delights the crowd performing his dinner routine most evenings! The Port Douglas Sunday Markets take place every Sunday at Anzac Park from 8:00am until 1:30pm. Popular with locals and tourists, the markets are a great place to find original arts and crafts, jewellery, pottery, tropical clothing, fruit and vegetables, glassware, books, homemade foods, unique Australian goods, souvenirs and more. Artists, street theater performers and buskers add to the entertainment of the day. The Bally Hooley is a historic little steam train that operates from the Marina Mirage station in Port Douglas every Sunday.The excursion, which takes a bit under one hour for the return trip from the Marina Station, passes through some attractive areas of mangrove, the Sheraton Country Club, and a couple of resorts to the Station at St. Crispins which is adjacent to the 12th tee of the Mirage Golf Course. Located right alongside a tidal lake at St. Crispins, a couple of resident crocodiles can often be seen. At the terminus of St. Crispins Station, the locomotive is turned around on the turntable for the start of the return run to the Marina. Four Mile Beach begins at the northern rocky headland and features four miles of golden glorious sand and tropical palms. The beach is wide, flat and has a very small angle into the sea which is great for younger children and for bike rides. Build a sand castle with the kids or explore and play with the small crabs that make the beach their home. Beach Day at Port Douglas Carnivale is always a fun occasion for families featuring a dedicated Kids Fun Zone hosting the legendary sandcastle competition, treasure hunt and giant water slide. Mossman Gorge lies 20km north of Port Douglas and is set within the world heritage-listed Daintree National Park. This is a stunning destination to explore the rainforest and enjoy close encounters with nature. Easily accessible for families with children of all ages, short tracks will lead you through the rainforest to viewing platforms of the cascades. Popular sightings include giant ferns, strangler figs, inquisitive Ulysses butterflies and Boyd’s forest dragons. A makeshift beach provides a perfect opportunity for a refreshing swim and makes for a great picnic spot too, however children need to be watched closely as currents flow around the rocks which can be quite fast, especially after rain. An eco-friendly, electric shuttle bus operates every 15 mins from 8am – 6pm from the Mossman Gorge Centre to the heart of the Gorge, transporting visitors the final 2 km into the park. To make the most of your own visit to Mossman Gorge, discuss the best trail to take with young children at the Visitor’s Centre prior to setting out. Go down to the Rex Smeal Park (located at the end of Macrossan Street). It's a beautiful spot enjoy a picnic, kick back and relax, and allow the kids to have a play. At the far end of the park is a private beach and rocks at the headland where you can fish for queenfish, trevally, barramundi and small black tip reef sharks. 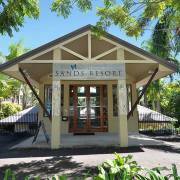 The picturesque St.Marys Chapel by the Sea is located near the Sugar Wharf where you may catch a glimpse of a wedding taking place at this famous Port Douglas landmark. It’s wooden and stained glass interior holds a vivid history. Catch the Cane Toad Races at The Iron Bar - a must see comedy show for the whole family. With it's rustic Australiana theme and lively atmosphere, the Ironbar has been a hit with locals and tourists since 1994, and as crazy as it sounds, the famous cane toad races have taken place since then. A ‘fun for the whole family’ experience, the show kicks off every night at 8pm. Open for lunch & dinner 7 days a week, why not enjoy some authentic Aussie cuisine beforehand, then ‘hop on in’ to the races. After the show, stick around and sing along to family karaoke. The Ironbar is located at 5 Macrossan St.
Get in touch with the past and visit the Port Douglas Courthouse museum. Identified as the second oldest surviving timber court house to be commissioned by the Queensland Government, this is the only building to have survived the 1911 cyclone and the oldest building in town. This small museum in Port Douglas’s old courthouse showcases exhibits from the gold rush to tourist town, maps of the roads of romance and historical walks, and a famous murder trial that remains controversial to this day. Open Tuesdays, Thursdays, Saturdays and Sundays from 10am to 1pm, entry is a gold coin donation and children and students are free. Wavedancer sails to the calm, clear lagoon waters of the Low Isles. The Low Isles is suitable for everyone, and perfectly ideal for swimming, snorkelling and families. A host of reef activities awaits to maximise your reef experience. Travelling to this part of the Great Barrier Reef is a wonderful educational opportunity for children in particular. Low Isles is surrounded by 165 different species of hard & soft corals and is a haven for Turtles. Snorkelling is a ton of fun and a brilliant way to view this watery wonderland. Snorkels, masks and fins are available in child sizes and various flotation aids available for your child’s use. For non-swimmers coral viewing is so easy with a glass bottom boat tour, or take a guided beach walk and find out more about the unique marine life living at the waters edge. Hartleys Crocodile Adventures is loved by many. Located just 40 minutes north of Cairns, Hartleys is the best place to see crocodiles and local wildlife in Tropical North Queensland. The entertaining and educational wildlife presentations including snakes, cassowaries, koalas, crocodiles and quolls really make it a fun day out, and the boat cruise provides the thrill and excitement of seeing crocodiles up close in their natural habitat. Curious to try a croc burgar? Now you can at Lilies Restaurant on the deck overlooking Hartleys lagoon. The Quicksilver Outer Barrier Reef Cruise makes for a fun Great Barrier Reef experience for the whole family. From young to old, everyone can access the reef and take away with them an unforgettable experience. All reef activities take place from the Quicksilver Pontoon - a floating dual level platform situated at the Outer Barrier Reef. Snorkels, masks and fins are available in child sizes, there are also various flotation aids available for your childs use. For those who prefer to stay dry, then you can explore the stunning reef from the comfort of a Quicksilver sub. The semi submersibles cruise slowly through the colourful coral gardens giving passengers the opportunity to experience a snorkellers-eye view of the marine life. Travelling to the Great Barrier Reef is a wonderful educational opportunity for children, and the underwater observatory is the perfect spot to watch fish feeding take place, as well as view "first time" divers taking part in introductory dives. Safe, fun, fully guided and with no experience necessary - Jungle Canopy Surfing is an adventure activity for all ages. Fly through the trees on flying fox ziplines, stopping at 5 tree platforms to take in spectacular bird’s eye views over the Daintree Rainforest, down to cascading streams and out to the Great Barrier Reef. Jungle Surfing is the adventure activity for all ages from 3 - 103, so the whole family can enjoy the thrill of flying through the rainforest. The smallest child harnesses fit the average three year old upwards and the adult harness are suitable for persons up to 120kg (260lbs or approximately 19 stone). The tour itself takes around 1.5-2 hours from pick-up to drop off, and you’ll spend around 1-1.25 hours up in the trees, with plenty of time on each platform to experience the forest environment. Join a small personalised ride through the Daintree Rainforest and surrounding property at Daintree Station, with experienced guides from Giddy Up ensuring your safety & comfort. Suitable for riders from 6 years +, beginners to advanced. This fantastic ALL weather experience provides great fun for the whole family!! 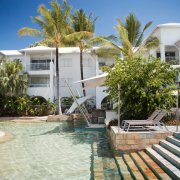 Morning sessions commence at 9:00am and include 2 hours of riding and transfers from your Port Douglas accommodation. Tuition will be provided before commencing on the guided trails.